ITER Director-General Motojima and Laurent Schmieder, of the European Domestic Agency, press the switch that finalizes the installation of the 493rd and final seismic pad in the Tokamak Pit. 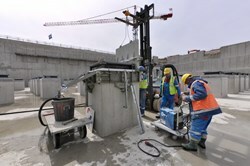 The last step in installing a seismic pad consists of pouring highly fluid mortar into the small space that persists between top of the concrete plinth and the bottom of the pad's metal plate after the pouring of second-phase concrete. An ingenious technique was developed specifically for ITER to avoid the formation of bubbles in the mortar: a thin polyethylene film sealing the bottom of the mortar chute is instantly vaporized by the passage of a strong electric current, thus producing a gush of mortar. On Wednesday, 18 April, the switch that sent the current into the film was jointly pressed by ITER Director-General Osamu Motojima and Laurent Schmieder, head of the Site, Buildings and Power Supplies Division for the European Domestic Agency F4E. The 493rd—and final—seismic pad has now been finalized, on time and within budget. The event marked an important milestone for ITER, F4E and NUVIA, the company in charge of installing the seismic pads on the basemat of the Seismic Pit. Pad #493 stands precisely at the centre of the star-like formation of plinths that will directly bear the weight of the Tokamak. Although all the ITER seismic pads are identical, number 493 has special symbolic value: it stands precisely at the centre of the star-like formation of plinths that will directly bear the weight of the Tokamak. And to celebrate the event, instead of opening lunch boxes or taking a quick trip to the worksite canteen, workers and guests were treated to a traditional méchoui (from the Arabic meaning "roasted") in the large tent standing on the site of the future Hot Cell Facility. In typical south-Mediterranean fashion, mussels and octopus soup were served first, as two whole sheep finished roasting on a bed of embers outside the tent.